When John T. Edge came out to Austin a few months ago he must’ve really had his nose to the ground as he miraculously found La Flor. It’s one of our better taco carts and decidedly under the radar tucked away in a side parking lot of a bordering on decrepit quick mart on South 1st st. Edge was on the trail of breakfast tacos and Angela, the chef, serves up some good ones but to me she’s more of a meat specialist. Her desebrada is incredible, perhaps the best in Austin proper. But we’re here to discuss carnitas and she puts out some good ones. The pork has been roasted, torn into hunks and shreds and then brought to temp on her tiny flat top. Standard garnish is chopped sweet onion, cilantro and a smoothly blended, red, chile seca salsa . While it’s most likely not hot enough for the chile heads out there it is a carefully rendered sauce. The carnitas are merely good. But what takes her cooking into the nether is her tortilla making. Specifically her rare, hand-patted style of corn tortilla making. Lots of ladies around town make their tortillas from scratch but invariably they’re made on a tortilla press or perhaps with a rolling pin. You really don’t see the hand-patted, rustic style very often these days. That’s what sets Angela apart from her competitors. Perhaps one day you’ll roll in and as you place your order you’ll notice her absence. Don’t fear. The young man Christian, that works either with her or in her stead is her son and he’s been well trained. This is a highly skilled mom/son cooking team turning out some very fine Mexican street food. 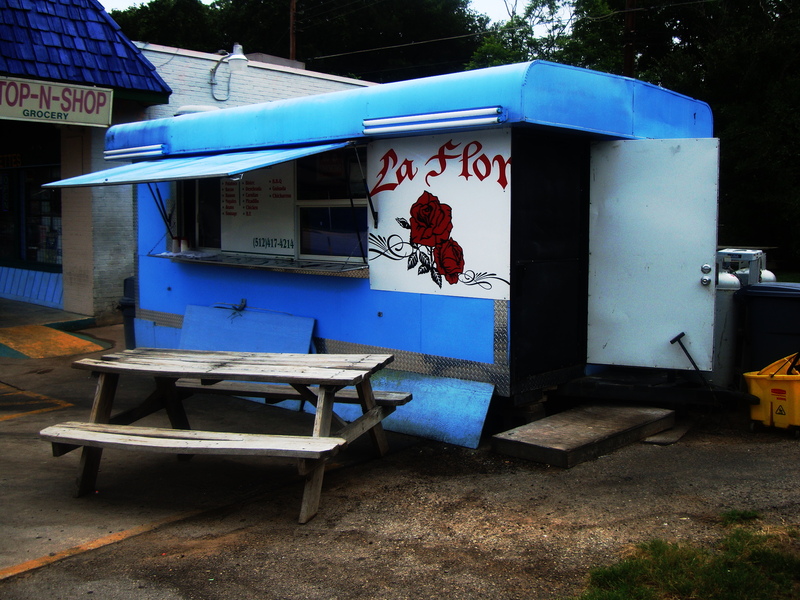 While I wouldn’t go out of my way for their carnitas I regularly drive the 11 miles from my house to La Flor for a brace of desebrada and picadillo tacos. They’re that good.